Q: Leaders of some countries and international organizations are now in China for visits and for the Boao Forum for Asia annual conference. During their meetings with Chinese leaders, they expressed their commitments to the free trade regime and liberalization and facilitation of trade and investment. As everyone is following the escalating trade friction between China and the US, what messages have these meetings sent out to the outside? A: It is true that the international community is closely following the development of the trade issue between China and the US. This is because this issue not only concerns China and the US, but also bears on everyone in one way or another, and it concerns a matter of principle which is about whether or not we will follow international rules, defend the multilateral regime, and promote the economic globalization. What the US has said and done recently, especially its adoption of trade restrictive measures, amounted to a confrontation of unilateralism against multilateralism, protectionism against free trade. Its measures target everyone and the interests of all, not just China and China's interests. These leaders of states and international organizations made clear their positions and attitudes during meetings with the Chinese side, which reflects the reality that in the international community, people with vision understand that it is international cooperation and multilateral coordination, rather than unilateralism and protectionism, that offers a way out, and rules-based international order must be preserved. The wrong move made by the US side has made the international community highly concerned and worried, just like an old Chinese saying goes "a just cause gains wide support, and an unjust one enjoys none." China stands ready to work with the international community to oppose trade protectionism, support liberalization and facilitation of trade and investment, and safeguard the authority of the multilateral trading regime. We will work together to forge an open world economy, build a more open, inclusive, balanced, and win-win economic globalization that benefits all, and make greater contributions to human progress. 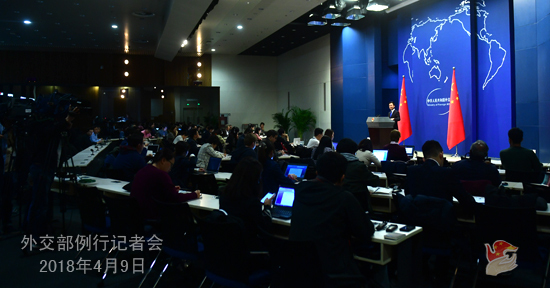 Q: We noted that Austrian President Alexander Van der Bellen has brought what the media called "Austria's largest-ever state visit delegation" to China. Both the two sides speak highly of this visit. Could you please talk about the outcomes and highlights of this visit? A: Both China and Austria attach great importance to this state visit paid by Austrian President Alexander Van der Bellen as well as his attendance at the Boao Forum for Asia Annual Conference 2018. He is joined by a high-level delegation including Chancellor Sebastian Kurz and a number of cabinet ministers. Yesterday, President Xi Jinping hosted a grand welcoming ceremony for and held a talk with President Alexander Van der Bellen, and Premier Li Keqiang also met with him. This afternoon, Chairman of the National People's Congress (NPC) Standing Committee Li Zhanshu will hold a meeting with him, too. After the meetings, the two heads of state witnessed the signing of intergovernmental cooperation agreements covering such key areas as judiciary, economy and trade, innovation, culture, intellectual property rights, transportation and sports. The two sides also published a joint statement on establishing a friendly strategic partnership. As to the talk between President Xi Jinping and President Alexander Van der Bellen, you may have read a detailed readout issued by the Chinese side, so I'm not going to repeat that. I would like to stress that the leaders of the two sides agreed that the establishment of the China-Austria friendly strategic partnership has specified the nature of our bilateral relations and pointed out the direction and goal for our cooperation going forward. In addition, the two sides agreed to continue with joint research on giant pandas. The Austrian side expressed its will to actively engage in the Belt and Road Initiative and support China in hosting a successful 2022 Winter Olympic Games. All this mutually beneficial cooperation will inject strong new impetus into the bilateral relations. Q: At the weekend, Japan activated what it called "Amphibious Rapid Deployment Brigade". Japanese Vice Defense Minister Yamamoto said that it shows Japan's firm will to hold fast to its islands. He talked about the increasingly difficult security situation surrounding the country and called the defense of its islands a critical mandate. What is China's comment? A: Due to historical reasons, Japan's move in the field of military security has been widely followed by its Asian neighbors. We hope that Japan will faithfully respect its neighbors' security interests and concerns and act in a way that is more conducive to regional peace and security rather than the opposite. China's position on the Diaoyu Dao issue has been consistent and clear-cut. Q: The Ministry of Commerce said on Friday that negotiations with the US on trade issues could not happen under the current conditions. Does this mean that China is currently unwilling to enter into negotiations with the US? A: My colleagues from the Ministry of Commerce has briefed you on relevant situation. Recently, the financial and economic officials from the Chinese and US sides have not conducted any negotiation on trade issues. Under the current circumstances, it is even more impossible for the two sides to do so. This trade conflict was initiated by the US alone and it is entirely the one to blame. The US is wielding the big stick of trade sanctions while keeping saying they are willing to talk. I am not sure who the US is putting on such acts for. Q: First, Vice Foreign Minister Kong Xuanyou has visited India just a few days ago and held wide-ranging talks with his counterpart, the Foreign Secretary Mr. Gokhale there. This is amid reports that a number of Indian ministerial officials are expected to visit China perhaps this month. Would you provide more details regarding that? Second, reports from India say that China has lodged a strong protest over the "transgressions" by the Indian army in the "Arunachal Pradesh". Could you share some details on that and what exactly the complaint is about? Third, according to reports, India has asked the government of the Hong Kong Special Administrative Region to arrest and hand over an Indian fugitive called Nirav Modi, who is accused of cheating banks in India for about two billion dollars. I understand that China has been conducting the campaign to get back the fugitives from abroad, especially who cheated the banks. How will China respond to this particular request from India? A: Let me go to your last question first. In accordance to the "one country, two systems" principle and the Basic Law of the Hong Kong Special Administrative Region of the People's Republic of China, with the assistance or authorization of the Central People's Government, the Government of the Hong Kong Special Administrative Region may make appropriate arrangements with foreign states for reciprocal juridical assistance. If India puts forward such request to the Hong Kong SAR, I believe the latter will handle it in accordance with the Basic Law, other relevant laws of the SAR and the judicial assistance treaties it signed with India. Regarding your second question, I'm not aware of the details of what happened along the China-India border recently as you mentioned. China's position on the China-India boundary issue remains consistent and clear-cut. The Chinese government has never recognized the so-called "Arunachal Pradesh". 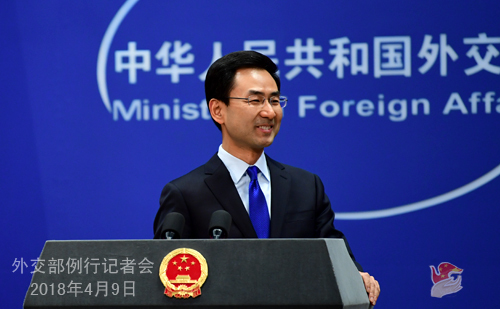 China and India are now in negotiation and consultation for proper settlement of the boundary issue, seeking a fair and reasonable solution acceptable to both sides. Before that is achieved, we hope India will conform to the treaties and agreements reached between the two sides, respect and abide by the Line of Actual Control, stop meaningless playing up and work with China to uphold peace and tranquility in the border areas. As to your first question, on April 6, Vice Foreign Minister Kong Xuanyou held consultations with Indian Foreign Secretary Vijay Gokhale in New Delhi. We have released information on that. You mentioned that there may be more interactions between China and India recently. I shall say China-India relations have maintained the momentum for development recently with close exchanges at various levels, so it's not surprising if that happens, and China will issue relevant information in due course. Q: As we understand, Pakistani Prime Minister visited Afghanistan on April 6, and the two sides reached many consensuses in political, economic and security fields. What's your comment? A: Pakistani Prime Minister Abbasi's visit to Afghanistan constitutes an important step forward by the two countries towards the improvement of their relations, showcasing their sincere will for and firm confidence in dialogue and cooperation. We noted that the two countries reached many consensuses, including on the Afghanistan-Pakistan Action Plan for Peace and Solidarity (APAPPS), advancing the Afghan reconciliation process and enhancing regional connectivity, etc. China highly commends and firmly supports this and believes it will be conducive to creating enabling environment for early realization of peace in Afghanistan and upholding peace and development of the two countries and this region. As a neighbour and friend to both Pakistan and Afghanistan, China stands ready to continue to play a constructive role in improving their relations and promoting tripartite cooperation among the three countries. Q: The UN Security Council said that it had an emergency meeting on alleged chemical attacks in Syria. What is China's position on the attacks? A: China's position on the issue of chemical weapons is consistent and clear. We oppose the use of chemical weapons under whatever circumstances and for whatever purposes by any country, organization or individual. No matter when and where chemical weapons are used, it is intolerable. 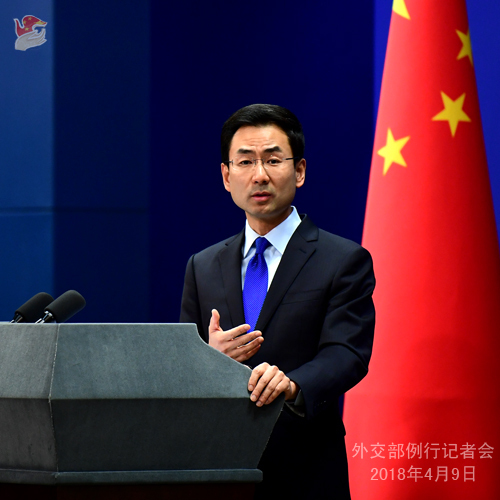 China maintains that a comprehensive, objective and impartial investigation shall be carried out to reach a fact-based conclusion that can stand the test of time, and perpetrators must be brought to justice. The issue of chemical weapons in Syria and the political settlement of the Syrian issue are closely linked. China supports the UN Security Council and the Organization for the Prohibition of Chemical Weapons (OPCW) in continuing to act as the main channels for addressing the use of chemical weapons in Syria. We hope that all relevant parties could reach a proper settlement to the issue with a constructive attitude and through consultations, safeguard the solidarity of the Security Council, and collaborate with the relevant parties to move forward the process of the political settlement of the Syrian issue. Q: On April 4 local time, the National Electoral Commission of Sierra Leone declared Julius Maada Bio as the nation's new president according to the final results of the presidential run-off election, and Mr. Bio was sworn in the same day. What's your comment on this? A: The Chinese side congratulates Mr. Julius Maada Bio on his election as Sierra Leonean president. China and Sierra Leone enjoy profound traditional friendship and fruitful outcomes of cooperation in various fields, and we are good old friends who stick by each other through weal and woe. China stands ready to work with Sierra Leone to move forward the comprehensive strategic partnership and bring more benefits to the two peoples. Q: According to Syrian government media, an unnamed force has launched an air attack on a military base of Syrian government forces in the province of Homs. Do you have any comment on this? A: We keep stressing that the international community shall work together to peacefully resolve the Syrian conflict through political and diplomatic means. We hope that on the basis of ceasefire and cessation of violence, all relevant parties in Syria could endeavor to properly resolve the Syrian issue along the track of political settlement. Q: As reported by foreign media, some senior officials in the US administration have been flip-flopping on the trade issue with China. Some foreign media even say that they sent out mixed messages. Do you believe that the US side has lost its cool already? How do you think of the possibility of a trade war between China and the US? A: The US side provoked the current trade friction all by itself, and shall take full responsibility for it. What it did has violated the international trade rules, assaulted the multilateral trading regime, and betrayed its own promises. Its action is not in the interests of China, nor those of the US or the whole world. The measures we have been obliged to take so far as a way of defense are meant to counteract the US unilateral actions. They are defensive measures to protect our legitimate and lawful rights and interests, and also responsible actions aimed at safeguarding the global trade system. We have noticed that people of all walks of life in the US have called for a check on the situation to avoid a dangerous downward spiral and spare American families from any harms. In fact, the US equity and futures markets have already paid for the unwise and reckless behavior by the US side. The US side had better make a correct reading of the current situation and entertain no illusions. It needs to halt its steps down the erroneous path. We have already drawn up very detailed countermeasures. If the US goes ahead and publishes the list for $ 100 billion products, we will fight back immediately without hesitation. We the Chinese people always mean what we say. No one shall underestimate our will and determination to safeguard our legitimate rights and interests. We are confident that we are going to have the last laugh. Q: After alleged chemical attacks in Syria, US President Donald Trump said that President Putin and Iran are responsible for backing Assad. Does China have any comments to his words? A: Like what I said before, China opposes the use of chemical weapons under whatever circumstances and for whatever purposes by any country, organization or individual. 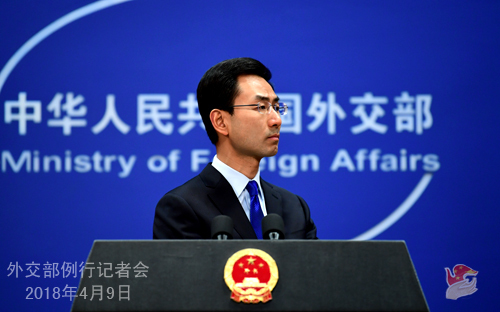 With regard to what happened in Syria, China maintains that a comprehensive, objective and impartial investigation shall be carried out to reach a fact-based conclusion that can stand the test of time. Q: Taiwanese media reported that the US administration has approved the marketing license that would allow American manufacturers to sell technologies to Taiwan for the building of submarines. And a separate report said that the incoming US National Security Adviser John Bolton might visit Taiwan in June. Does China have any comment on either report? A: I will answer your two questions together. We have noted relevant reports. The one-China principle is the political foundation of China-US ties. We firmly oppose the US side carrying out any official exchange and arms-sales with Taiwan. This position remains consistent, clear and firm. We urge the US to strictly abide by the one-China principle and the three China-US joint communiques, avoid having official contacts with Taiwan or trying to improve their relations in substantive ways, and stop military contacts and arms-sales with Taiwan so that China-US relations and peace and stability across the Straits will not be severely damaged. Q: The US Department of the Treasury's Office of Foreign Assets Control (OFAC) has imposed sanctions on 24 Russian individuals and 14 entities, citing the Kremlin's malign actions to undermine Western democracy. Russian Foreign Ministry said it would act in firm response to the US sanctions. What's your comment? A: China always opposes the wanton use or threat of use of sanctions in international relations. Both Russia and the US are globally influential major countries and permanent members of the United Nations Security Council, who shoulder important responsibility for global peace and stability. We hope relevant parties will properly resolve disputes through friendly negotiation on the basis of equality and mutual respect in accordance with international law and the norms governing state-to-state relations . Q: Recently the Philippines handed over to the Chinese mainland 78 telecom fraud suspects from Taiwan arrested in its law enforcement operations. What is China's comment? China and the Philippines have all along maintained close communication and cooperation in fighting against telecom and Internet fraud. China applauds and appreciates the Philippines' support and cooperation in this respect. In regard to the specifics of the case, I would like to refer you to the competent authorities. I shall point out that the victims of the criminal acts committed by these lawbreakers abroad are all Chinese citizens from the mainland. As such, the mainland surely has judicial jurisdiction over that. We highly commend the Philippine government's adherence to the one-China principle in handling this issue.